Replacing a diamond with a unique gemstone is the perfect way to reflect one’s individualistic personality and taste. Not only are colored gemstones a growing trend among royalty and stars, they are also the best way to add sophistication and pizzazz to a timeless wedding band. 1. Use a birthstone. A growing number of people have found the meaning behind adding their birthstones to their wedding rings. 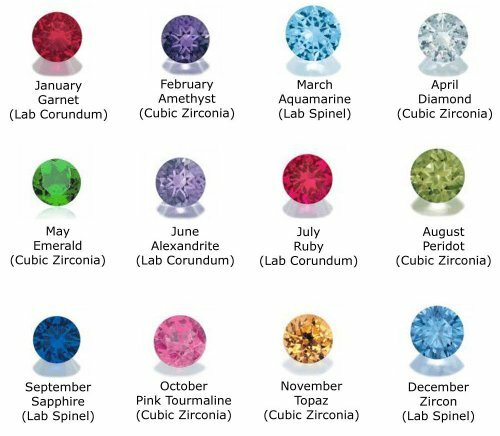 While some display the bride’s birthstone front and center, others may prefer to use a combination of the couples birthstones. Couples that have children may want to incorporate their birthstones into the ring as well. As a result, the bride will have a ring that is truly one-of-a-kind and represents the entire family’s bond. What could be more meaningful than that? Red: Undying love, passion, energy and power. Red rubies and garnets are just a few diamond alternatives that represent forever love. Yellow: Enthusiasm, optimism and playfulness. Yellow sapphires, citrines, and yellow topaz look amazing when paired with diamonds or alone in a setting. Black: Strength, health, and happiness. Black gemstones are truly eye-catching when contrasted by a brilliant silver band. Blue: Good health, confidence, and strength. Blue tanzanite, sapphires, and topaz are commonly used in engagement ring sets. White: Innocence, elegance, and harmony. Traditionalists who choose white topaz, moissanite, or quartz are simply romantics at heart. 3. Look for diamond alternatives. Diamonds are often seen as the symbol of everlasting love and used in engagement and wedding rings to reflect this deep meaning of affection. However, many people have discovered the beauty of using other gemstones in their engagement and wedding rings. Moissanite: This diamond look alike is actually more brilliant than a diamond. Although it is manmade, it is virtually perfect and has no cloudiness, blemishes, or inclusions. It is also more affordable than a diamond. People who want to stick with a traditional diamond yet may not be able to pay the hefty pricetag that comes with the precious gemstone, may want to consider a moissanite stone. Sapphires: Sapphires come in white, blue, and every other color of the spectrum. White sapphires spark certain similarities to a diamond and cost slightly less than moissanite. Blue sapphires are also extremely popular, as their dark richness looks amazing against a white gold or sterling silver band. In ancient times, sapphires represented the heavens and were thought to give the wearer truth, good health, and innocence. Some think sapphires protect the wearer against evil. For whatever reason, dark blue, pink, and white sapphires look gorgeous when included in a wedding set. Whether alternative gemstones are used as a way to complement the brilliant white diamond or as a replacement for a diamond altogether, gemstones can certainly make a statement. From diamond look-a-likes to other colorful gemstones, one may want to carefully consider using diamond alternatives when designing an engagement ring and wedding band.